Please view some of our services below. 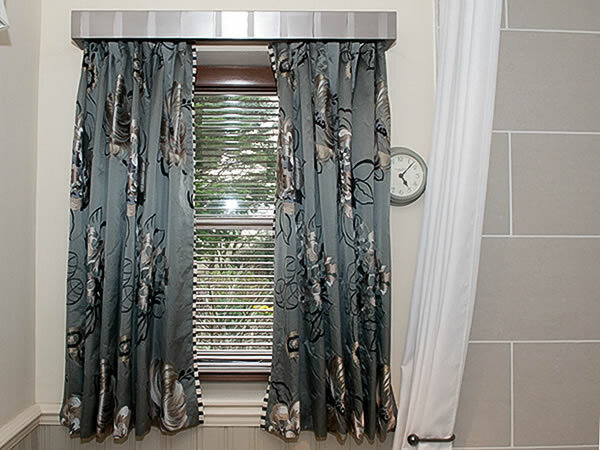 We specialise in curtains which are individually made to your specifications. We take a pride in providing a quality product. The linings and interlinings are sewn in by hand, the hems are hand sewn and many of our heading styles are hand sewn on traditional buckram. This means the curtains will hang and drape beautifully and the edges do not roll. We are happy to make up your own designs but can help with ideas if you want us to. 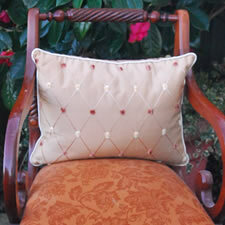 You may choose fabric from one of our suppliers or we can obtain most fabrics for you. Where the design requires we can also add trimmings by hand for a truly bespoke finish. 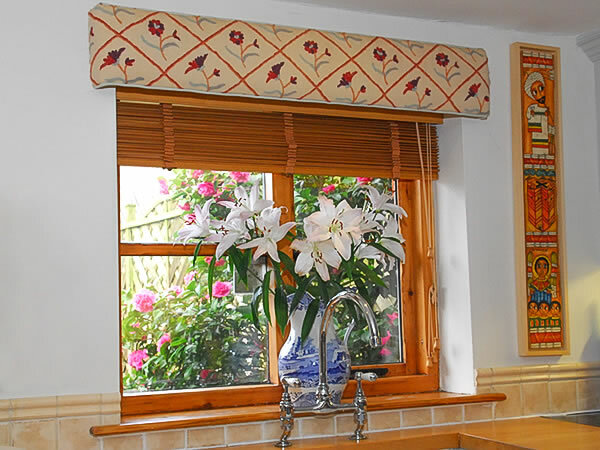 We carefully make each roman blind to fit inside or outside the recess, whichever is required. We can add trim, edging or contrast panels to suit your design. 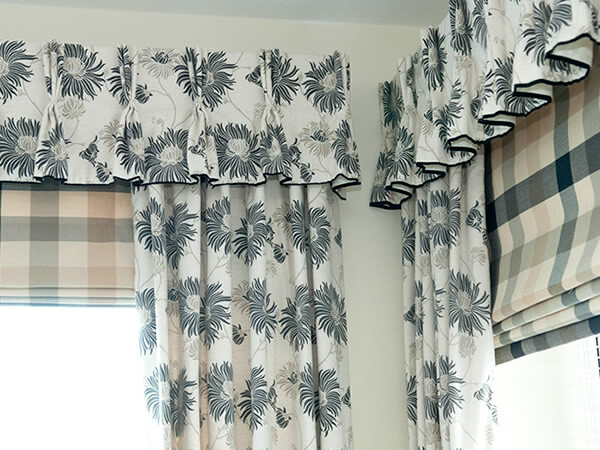 Roman blinds work best when they are not too wide and we suggest a maximum width of 130 cms. to ensure they look good whether they are lowered or raised. 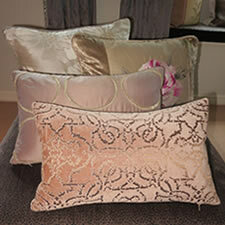 We make cushions, throws and tie backs to complement any scheme. Let your imagination run riot. 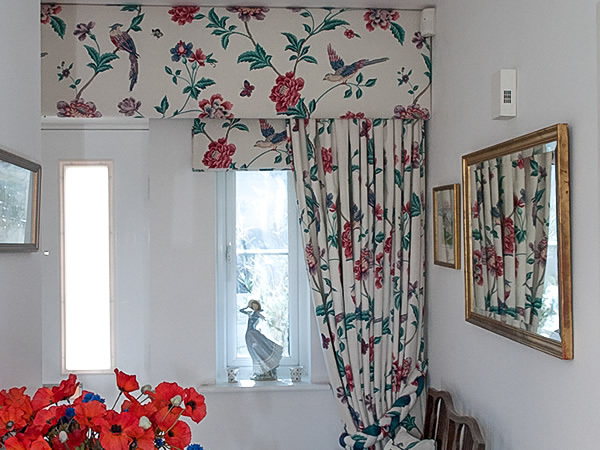 Pelmets and valances finish off a window and can provide height, style and interest. 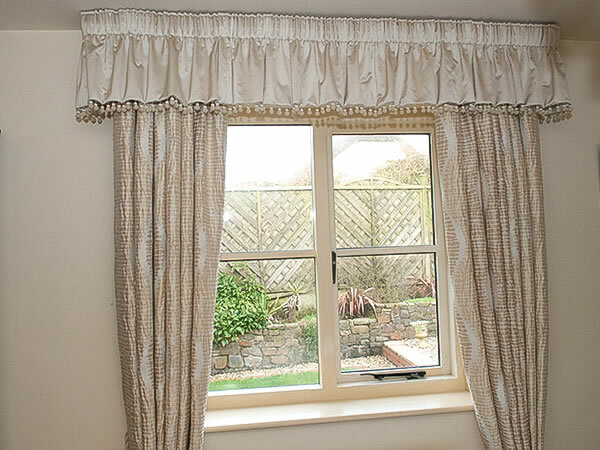 We make flat upholstered pelmets with shaped or straight bottoms and a wide range of pleated and gathered valances. 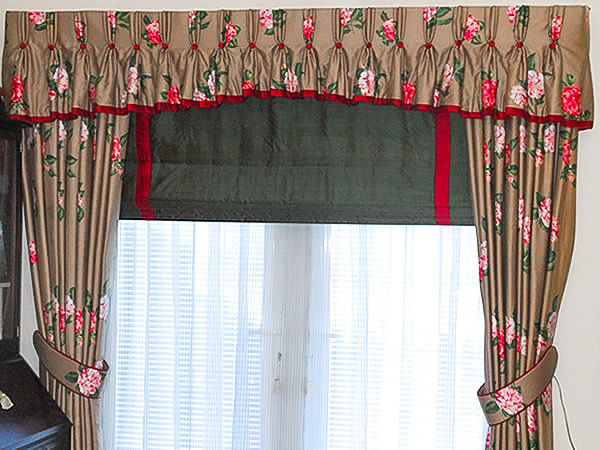 For the grander scheme swags and tails or swagged valances are available. 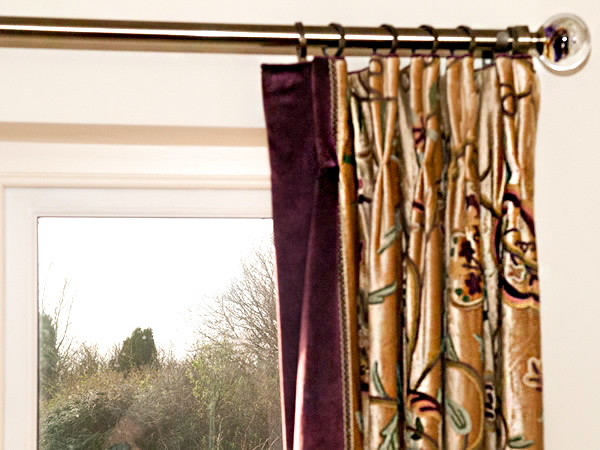 A lovely pair of curtains deserves a great pole. We have some beautiful ones to choose from. We have braids, bobbles, tassels, ropes, tie backs, fan edging, and ruche in many colours and styles - Just ask! We are based in North Devon and where possible we will try to visit you. Where this is not possible we can make from your measurements and send the finished items to you. Contact us by phone or email. If you are taking your own measurements, we will provide you with a measuring form. Please view some of our work. 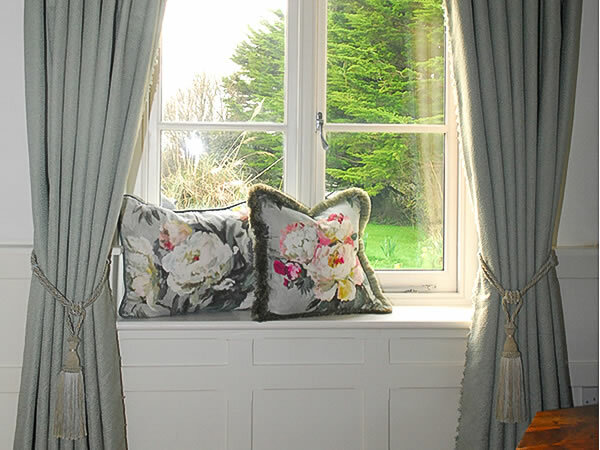 We love making curtains and have the time and the skills to make curtains for you to your individual requirements. We are not a factory and we make each order to your specifications. This way we provide a product that is different each time. We have a small work workroom deep in the north Devon countryside. We also have low overheads. Of course we go up to London regularly to keep up with the latest trends. This way we are able to offer good old fashioned service with quality and design of product you expect. 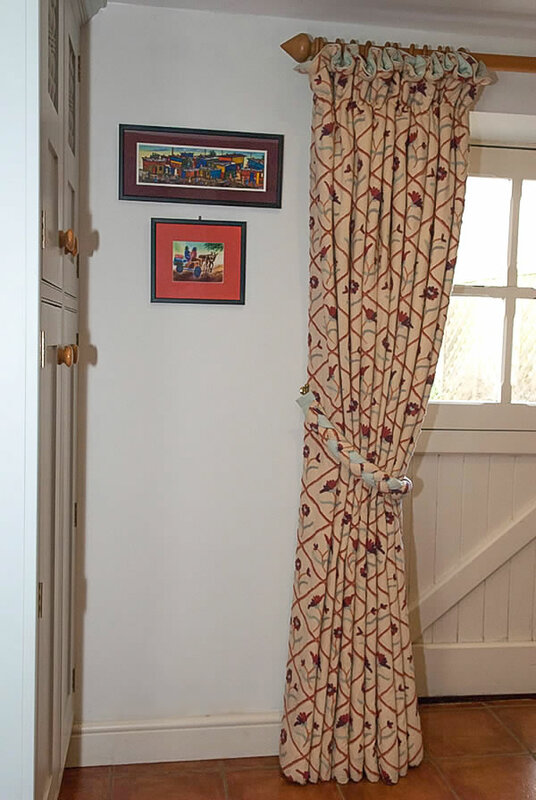 Copyright © Susan Macdonald, Curtain Maker 2019. All right reserved. Flat upholstered pelmet with contrast pipe top and bottom. 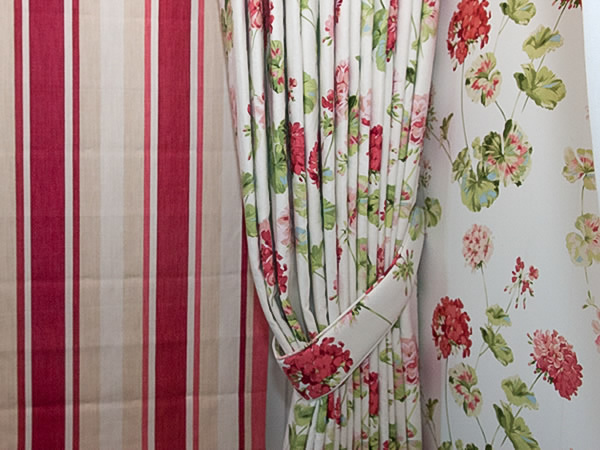 Lined and interlined door curtain with ruffle top with contrast pipe. Plaited tie back. 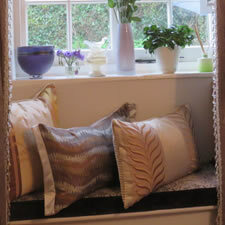 Silk curtains with contrast stripe edges. 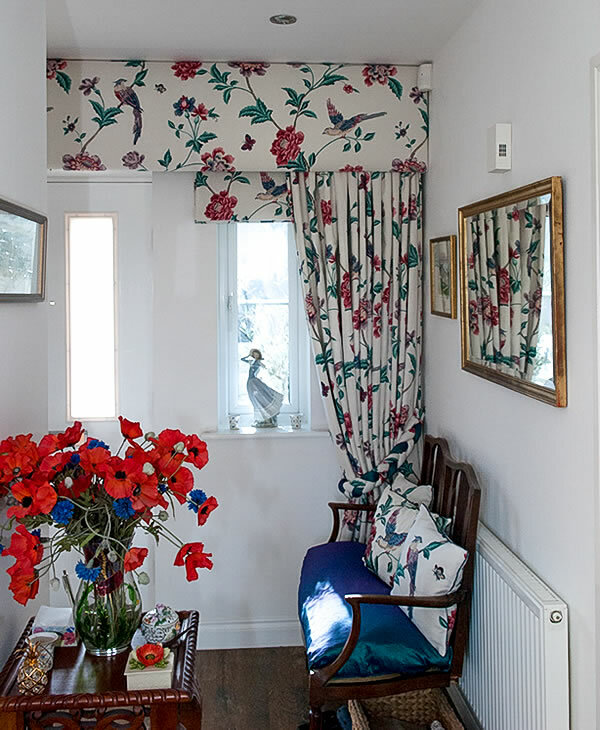 Hand double pleat curtains with contrast leading edge. Piping to top of pleats and contrast leading edge with braid. 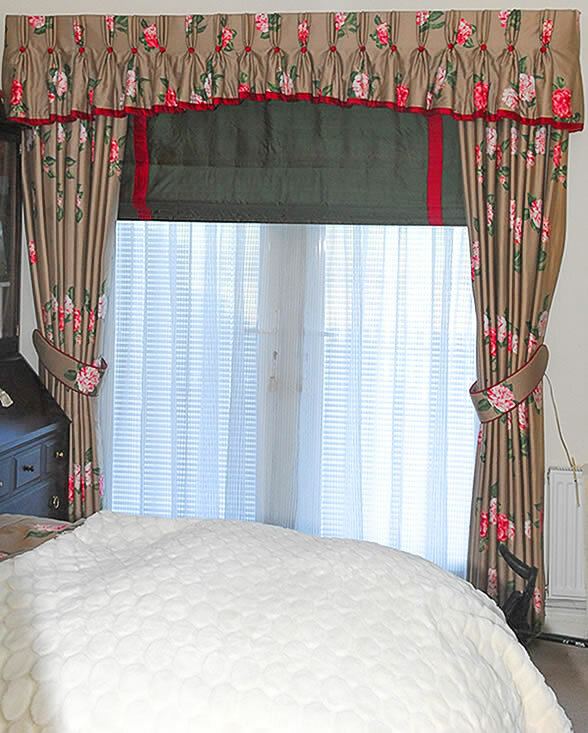 Silk curtains with hand triple pleated heading. Velvet ribbon braid inset from leading edges. 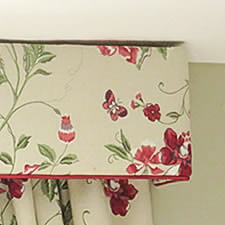 Roman blind in coordinating fabric. 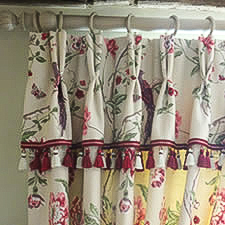 Pencil pleated valance with bobble trim over pencil pleat lined and interlined curtains. Plaited tie back and piped cushions complete this attractive hallway. 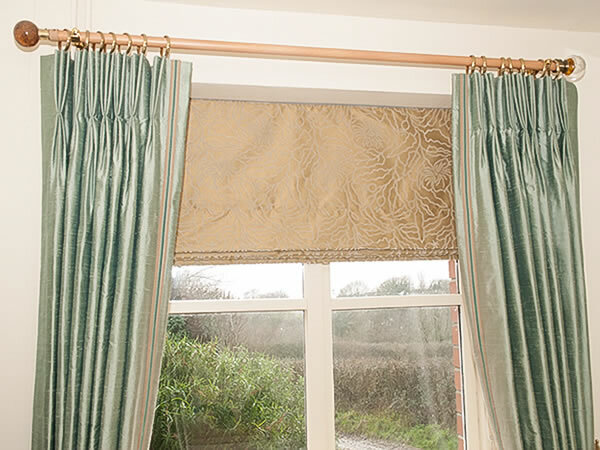 Silk roman blind with contrast bands framed by silk trimmed valance and tie backs. 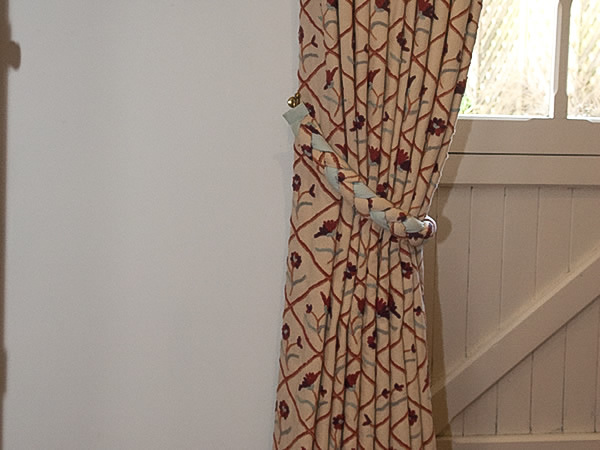 Roman blind and interlined door curtain with padded crescent tie back. 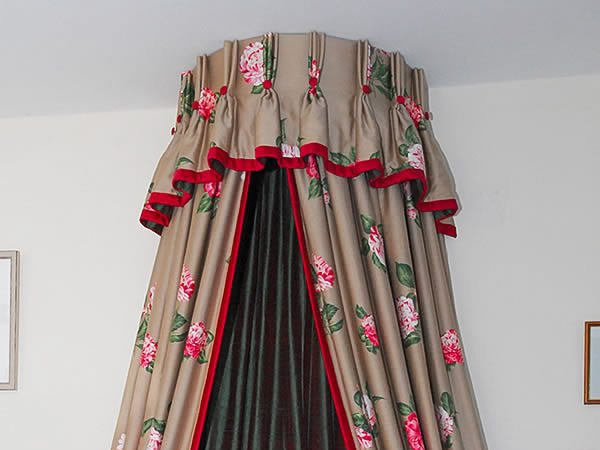 Triple pleated valances with contrast trim. Dress curtains and roman blinds. 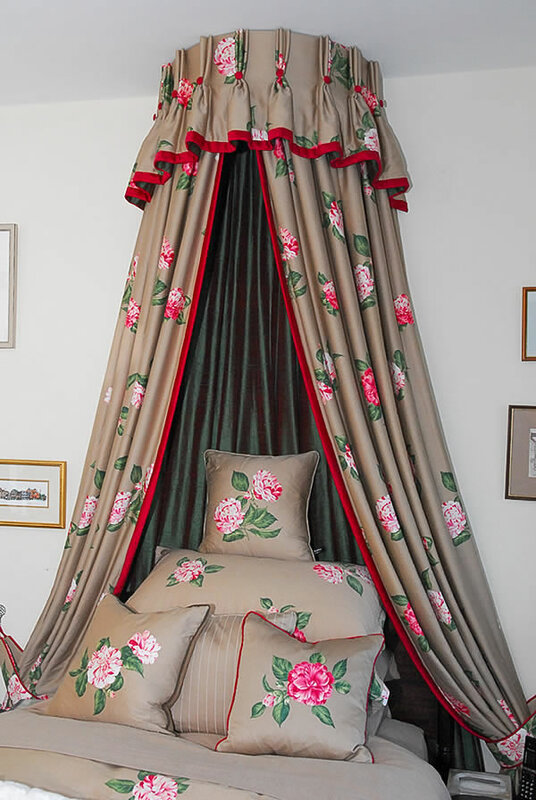 Silk trimmed and lined bed corona. 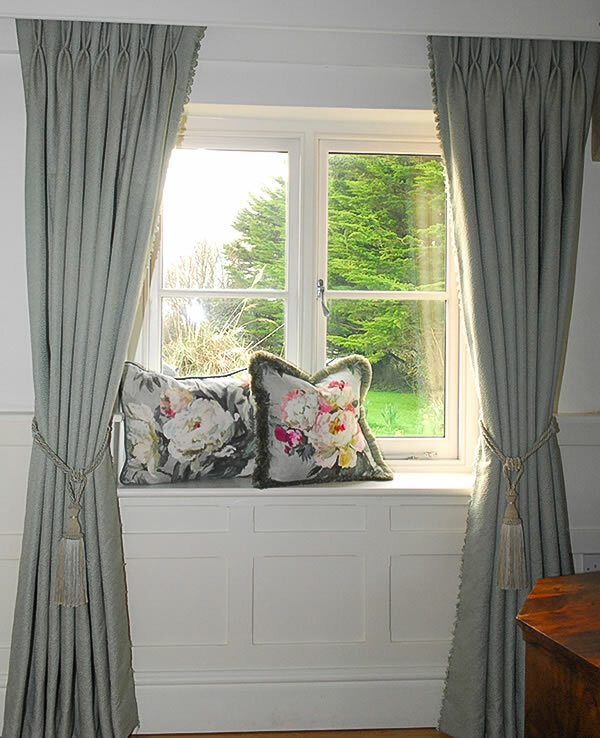 Double pleated curtains with hand sewn fan edging. 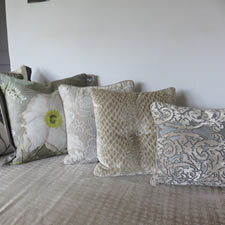 Cushions with piping and ruche edge. The full name of our company is Susan Macdonald. Our registered address is The Barn, East Philham, Hartland, Bideford, Devon, EX39 6DL, United Kingdom. You may instruct us not to process your personal information for marketing purposes, by sending an email to info@susanmacdonald.co.uk. In practice, you will usually either expressly agree in advance to our use of your personal information for marketing purposes, or we will provide you with an opportunity to opt-out of the use of your personal information for marketing purposes.